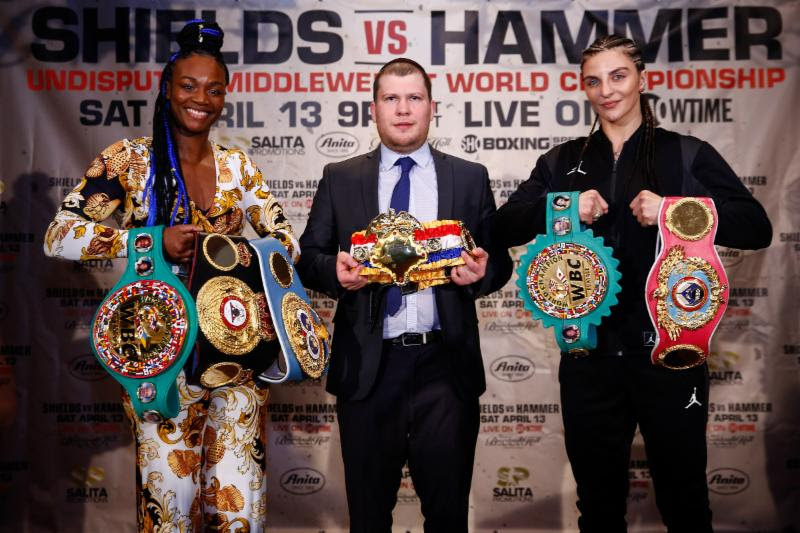 NEW YORK (April 10, 2019) - Undefeated middleweight champions Claressa Shields and Christina Hammer went face-to-face in New York on Wednesday just three days before arguably the most significant event in women's boxing history this Saturday live on SHOWTIME from Boardwalk Hall in Atlantic City, N.J.
IBF, WBC and WBA Champion Shields (8-0, 2 KOs) will unify with WBO Champion Hammer (24-0, 11 KOs) for the undisputed middleweight world championship. The winner will become only the second undisputed champion in women's boxing history and only the sixth fighter - male or female - to unify all four recognized world titles. Joining Shields and Hammer at Gallagher's Steakhouse in Manhattan was unbeaten heavyweight contender Otto Wallin, who takes on Nick Kisner as part of the SHOWTIME BOXING: SPECIAL EDITION tripleheader beginning at 9:10 p.m. ET/PT. "Hammer signed up for something she shouldn't have signed up for. She's going to get hurt on Saturday. I love that she has an accomplished record. People say I don't have power or this and that but on paper I've been an underdog in most of my fights and I've beat all those women. "I'm happy that everyone came out for this event and has supported it. This isn't as big as women's boxing can get, but it's the beginning of something great. "This is the hardest I've ever trained for a fight. Not because I don't think that I can beat her, but because of the spotlight, I don't want to let my fans down. I don't want to let the women who came before me down. They never got to have a fight as big as this one. I don't want anyone to say it's all hype. I want to put on a show. "I'm just being myself. I can't put all the pressure on me to be something I'm not. I love talking trash, that comes natural. There's a bit of truth in there too. When it gets to times like this, I'm not afraid to say how I feel. "The reason why I'm here is because I've taken on the biggest challenges and fought the best fighters. It feels good. I know that I'm going to beat her and take all of these belts home. "Women's boxing is becoming bigger and with 'All-Access' you can see that I train hard, spar against men and go hard for three minutes for 12 rounds. We've been around for a long time and we haven't gotten our just do yet. We're getting more and we're getting to the point where one day it can all be equal. "I'm glad Hammer is here and we're really going to fight. She's tough, but I've beat girls way stronger, faster and taller than her over and over again. I can't wait to do it again on Saturday." "I'm so happy to be here and have this great opportunity. I can't wait to get in the ring on Saturday and get all of these belts. I'm ready. "I'm very confident and I can't wait to show everyone why I'm 24-0 and been a champion for as long as I've been. "She can say whatever she wants here, because I'm going to show it in the ring. I don't like to talk too much. I'm here to show my skills in the ring and get all these belts. "I'm emotionless in the ring, because it's my job. None of her talk will affect me. When you're emotional in the ring, you make mistakes. "I know that it's a risk to come from Germany to the U.S. to fight Shields. But I have done everything to bring it to her and break her down round-by-round. I want to show the people who the real champion is. A real champion fights everyone, all over the world. "I'm very focused. I know that this is a historic fight. There is only one champion who can take these belts and that will be me. I've given everything for that goal. I sacrificed day after day in camp to achieve that. "I want to show that I'm the undisputed champion. I'm the longtime champion and I'm going to let the people see that women's boxing is exciting just like the men. This is a great match to show that. "We're both undefeated and in our primes. People wanted to see this fight and they got this fight. All of the talk is over. Now it's time to fight."